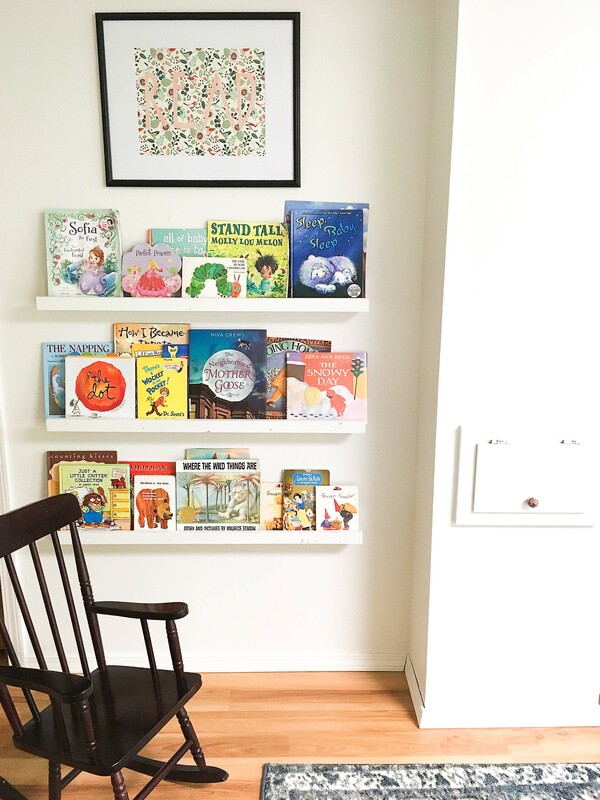 Organizing toys for function in a family home can be a major challenge, but there are ways to keep the kids happy and still keep your home beautiful and uncluttered. One of the best things that ever happened to me was living in a very small townhome, apartment and duplex. These smaller spaces forced me to take a closer look at the toys that we needed and wanted, where to store them and a system for getting my children to use and appreciate the toys. I remember one day being so frustrated that I could not keep my small living room clutter free. I realized that the toys had taken over. Instead of my living room being an inviting place for all of us, it felt chaotic and overwhelming because dolls, balls and other plastic invaders were filling in the spaces. I finally gathered all the toys and put them in my daughters room, leaving only a few of her favorite toys in our living room. This was my first realization that more toys does not mean more fun. Sometimes when we are given less options, it is easier to figure out what we really want. My daughters played more readily and didn’t miss any of the other toys that I had stored in the bedroom–out of their reach. I also learned to rotate the toys so that toys seemed new to her when they were brought out again. It was a win-win for everyone to have more clean space and more excitement over the toys. 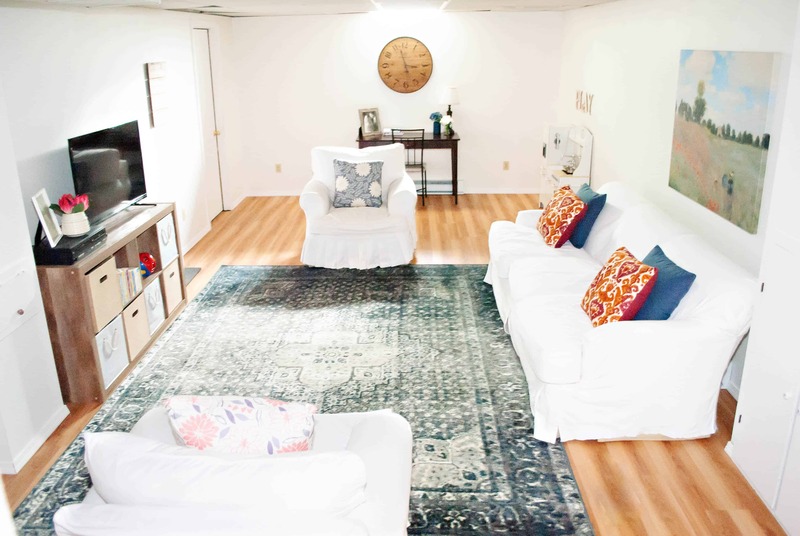 Later, when we moved into our larger home, I was so sick of looking at our basement and feeling depressed and dark. The carpet had been wet one too many times, the carpet was a redish color and looked like it belonged in an old doctor’s office and the walls were a dark greenish blue. Nearly all the bigger toys had been given to us and although I was grateful for them, I was ready to make the decisions about what toys we wanted, so that what I looked at and what they played with everyday was not only fun for my kids but also brought me joy. 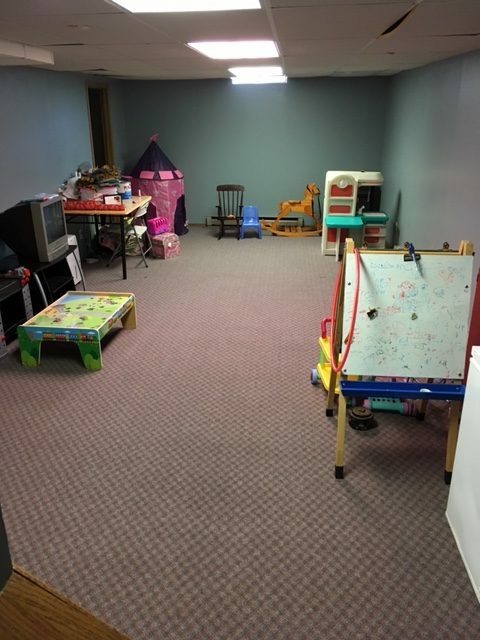 I made a plan for the room and ended up having a garage sale where we sold 95% of the toys. 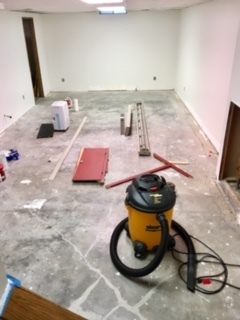 We ripped up the carpet, filled in the floor cracks, and replaced it with vinyl flooring. We painted the walls a beautiful white, added a nice rug, new-to-us white furniture and a toy storage system that was going to keep everyone sane. The space is still for our children, but it suits me as well so that I like to be down there with them. 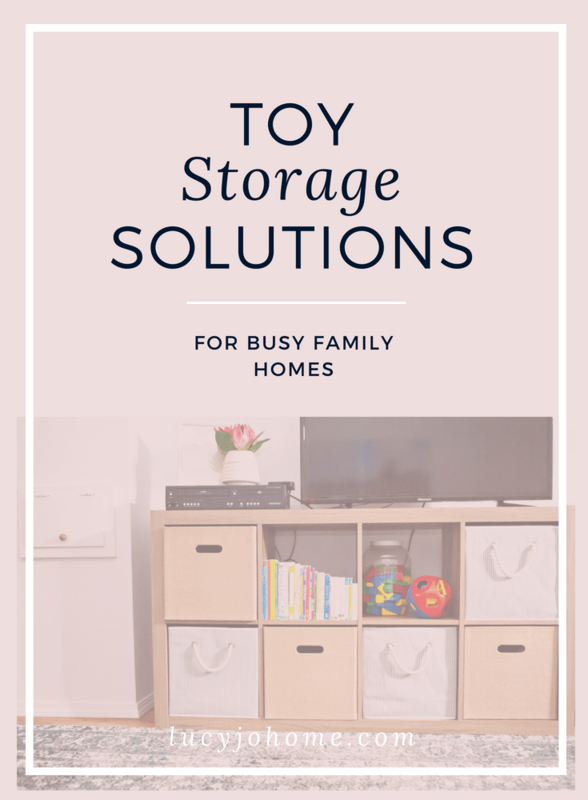 Click here to see the toy storage we chose. Here are cute bins to put toys and other things in. You can get bins anywhere you like as long as they are the right size. There are a lot of styles to choose from. I decided to use fabric bins because I don’t like to see the clutter. It really bothers me, but if you can handle seeing the toys, this type of toy storage will work too because it is, once again, easy for the kids to clean up. A toy chest can fill up fast and can get hard to find smaller things in, but it would be great for stuffed animals and other larger toys. This toy storage is nice because it has a place for books and toys and would be easy for kids to put things away after use. 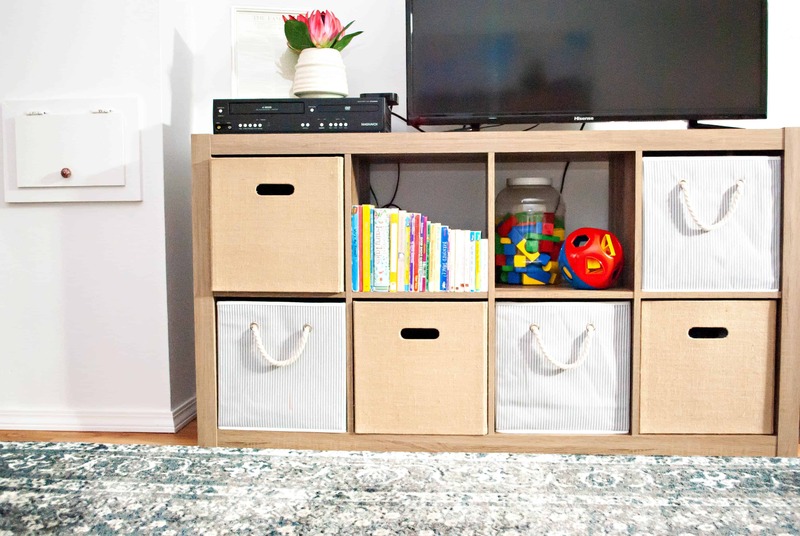 Create storage that is easy for your kids to put things away quickly. The more complicated the system, the less likely you will be able to get them to clean up. I used to have everything categorized just so, but I have learned that if the toys are in the bins, I am happy and the space is lovely to be in. My OCD does not jive well with kid-friendly systems sometimes, so I have learned to live with practicality. For the first few times, help them clean up after they play so that they see the process modeled, and so they don’t get too overwhelmed. Once they have seen how toy clean-up is done, they will be ready to do it on their own later. Make it an expectation to clean up before moving on to the next game or activity. Also, I won’t help clean up unless my kids are participating. My girls have learned that it is better to have Mom’s help, so they get busy picking up. Less is more. Remember that kids can truly play for hours in the dirt, with a box or a stick. More toys does not mean more fun, so pick out the toys that you think they will really play with and store the other toys somewhere they can’t get to, so that at another time when they are feeling bored with what they have, you have some “new” toys to pull out. Remember, the less you have for them to get out, the less clean up. Also consider that with less options, your kids can get creative and imaginative with what is available to them. You are not depriving your children if every toy they own is not at their disposal. Most family homes have more toys than they know what to do with. Choose toys and storage that fit your style so that the toys are not an eye sore in your space. I know it is hard to completely eliminate having toys that are not stylish, but it is possible to find toys that are in colors and styles that you like. 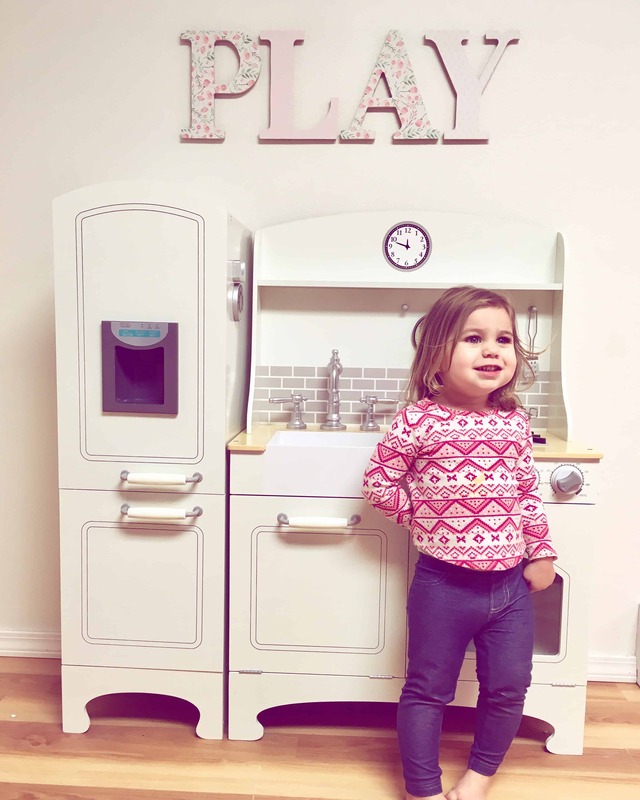 I love our play kitchen because it totally fits my style and is super fun for my girls. As your kids get older, you can ask for their opinions more. I am a lot more laid back about their bedrooms, so they do have spaces to make more choices in. When the books have to be put away vertically, it makes it hard for my little ones not to bend the pages or give up on putting them away all together. Another perk of storing them face open is that my kids tend to read more when they can see the titles and pictures of the book. Making the book shelves and installing them is really easy. I will try to get Cody to create a simple tutorial for you. I hope that as you plan out your living room or playroom that you can find ways to minimize the clutter and add more beauty and function to your space. Keeping your kids happy does not mean you have to sacrifice your sanity or style.